Nickname(s): Baseballtown, Pretzel Capital of the World. 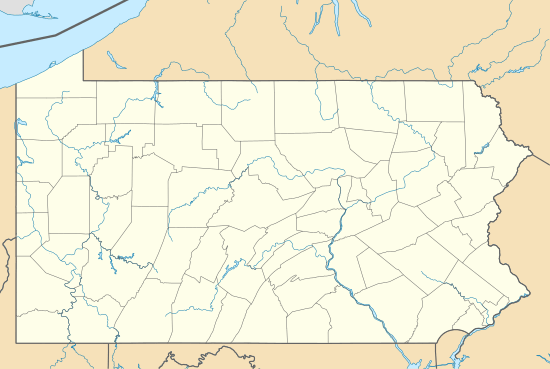 Reading (/ˈrɛdɪŋ/ RED-ing) (Pennsylvania German: Reddin), is the county seat of Berks County and with a population of 87,879 is the fifth-largest city in Pennsylvania. 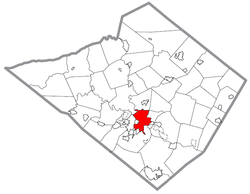 Located in southeastern Pennsylvania, it is the principal city of the Greater Reading Area. The 500-block of Court Street in Downtown Reading, with Berks County courthouse on the left. Reading and its suburbs, 1955. By the time of the American Revolution, the area's iron industry had a total production which exceeded England's. That output that would help supply George Washington's troops with cannons, rifles, and ammunition in the Revolutionary War. During the early period of the conflict, Reading was again a depot for military supply. Hessian prisoners from the Battle of Trenton were also detained here. Reading is located at 40°20′30″N 75°55′35″W﻿ / ﻿40.34167°N 75.92639°W﻿ / 40.34167; -75.92639 (40.341692, −75.926301) in southeastern Pennsylvania, roughly 65 miles (105 km) northwest of Philadelphia. According to the United States Census Bureau, the city has a total area of 10.1 square miles (26 km2). 9.8 square miles (25 km2) of it is land and 0.2 square miles (0.52 km2) of it (2.39%) is water. The total area is 2.39% water. The city is largely bounded on the west by the Schuylkill River, on the east by Mount Penn, and on the south by Neversink Mountain. The Reading Prong, the mountain formation stretching north into New Jersey, has come to be associated with naturally-occurring radon gas; however, homes in Reading are not particularly affected. The surrounding county is home to a number of family-owned farms. BARTA bus in downtown Reading. 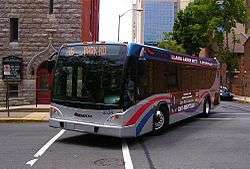 Public transit in Reading and its surrounding communities has been provided since 1973 by BARTA, the Berks Area Regional Transportation Authority. BARTA operates a fleet of 57 buses serving 21 routes, mostly originating at the BARTA Transportation Center in Downtown Reading. BARTA also provides paratransit service in addition to fixed route service. In addition, Greyhound and Bieber Trailways bus routes are available from the InterCity Bus Terminal. The former Reading Railroad Franklin Street Station was refurbished and reopened to bus service on September 9, 2013 with buses running the express route back and forth to Lebanon Transit. This Lebanon Route was discontinued after a short period. Now the refurbished Station sits vacant. A number of federal and state highways allow entry to and egress from Reading. U.S. Route 222 Business is designated as Lancaster Avenue, Bingaman Street, South 4th Street, and 5th Street. U.S. Route 422 Business is designated as Penn Street, Washington Street (westbound), Franklin Street (eastbound), and Perkiomen Avenue. U.S. Route 422, the major east-west artery, circles the western edge of the city and is known locally as The West Shore Bypass. PA Route 12 is known as the Warren Street Bypass, as it bypasses the city to the north. PA Route 10 is known as Morgantown Road. From the 1960s to the late 1990s, the section of current U.S. Route 222 from Spring Blvd to 5th Street Highway was known locally as the 'Road to Nowhere'. Passenger trains ran between Pottsville, Reading, Pottstown and Philadelphia until July 27, 1981, when transit operator SEPTA curtailed commuter service to electrified lines. Since then, there have been repeated calls for the resumption of the services. In the late 1990s and up to 2003, SEPTA, in cooperation with Reading-based BARTA funded a study called the Schuylkill Valley Metro which included plans to extend both sides of SEPTA's R6 passenger line to Pottstown, Reading, and Wyomissing, Pennsylvania. The project suffered a major setback when it was rejected by the Federal Transit Administration New Starts program, which cited doubts about the ridership projections and financing assumptions used by the study. With the recent surge in gasoline prices and ever-increasing traffic, the planning commissions of Montgomery County and Berks County have teamed to study the feasibility of a simple diesel shuttle train between the Norristown/Manayunk Line and Pottstown/Reading. In the city the population was spread out, with 29.9% under the age of 18, 11.7% from 18 to 24, 28.9% from 25 to 44, 17.0% from 45 to 64, and 12.4% who were 65 years of age or older. The median age was 31 years. For every 100 females there were 93.3 males. For every 100 females age 18 and over, there were 88.5 males. As of the American Community Survey 1-Year Estimates, Reading had a population of 80,997. The racial makeup of the city was 48.8% White, 14.0% African American, 0.2% Native American, 1.4% Asian, 0.0% Pacific Islander, 31.1% from other races, and 4.5% from two or more races. 56.3% were Hispanic or Latino of any race, with 33.5% being of Puerto Rican descent. 33.0% of all people were living below the poverty line, including 42.0% of those under 18. The city of Reading is protected by the 135 firefighters and paramedics of the Reading Fire and EMS Department (RFD). The RFD operates out of seven fire stations throughout the city. The RFD operates a fire apparatus fleet of five Engine Companies, three Ladder Companies, one Rescue Company, two Brush Units, and three front-line Medic Ambulances. The Fire Department also operates a non-emergency transport BLS ambulance and three wheelchair units. In 2013, fire units responded to 8,626 incidents. EMS responses totaled 16,773 calls for service. As of April 1, 2011, Engines 13 and 14 were disbanded due to budget cuts. Engine 13 was quartered with Engine 1 and Engine 14 was quartered with Engine 5. Also, Engine 7 was re-organized from Engine 11. Department staffing is 2 firefighters per apparatus. Reading is known for the Reading Fightin Phils, minor league affiliate of the Philadelphia Phillies, who play at FirstEnergy Stadium. 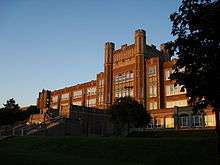 Notable alumni are Larry Bowa, Ryne Sandberg, Mike Schmidt, Ryan Howard, and Jimmy Rollins. Reading Public Museum in 2011. Reading is the birthplace of graphic artist Jim Steranko, guitar virtuoso Richie Kotzen, George Baer Hiester, singer Taylor Swift, and most notably, novelist and poet John Updike and the world-renowned poet Wallace Stevens. Marching band composer and writer John Philip Sousa, the March King, died in Reading's Abraham Lincoln Hotel in 1932. Keith Haring, NFL quarterbacks Chad Henne, Kerry Collins, wide receiver Steve Kreider, are not from the City of Reading, but surrounding towns in Berks County. Reading is home to the 14-time world-champion drum and bugle corps, the Reading Buccaneers. The City of Reading and Reutlingen, Germany are sister cities which participate in student exchanges. Students from Reading High School can apply to become a part of the exchange and travel to Reutlingen for 2 weeks (Mid October to Early September) and in return host their German exchange student in the spring. Kutztown University also has a program with Reutlingen. Reading's Pagoda seen from Skyline Drive. 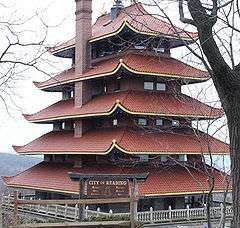 In 1908, a Japanese-style pagoda was built on Mount Penn, where it overlooks the city and is visible from almost everywhere in town. Locally, it is referred to as the "The Pagoda". It is currently the home of a café and a gift shop. It remains a popular tourist attraction. The book and movie Rabbit, Run and the other three novels of the Rabbit series by John Updike were set in fictionalized versions of Reading and nearby Shillington, called Brewer and Olinger respectively. Updike was born in Reading and lived in nearby Shillington until he was thirteen. He also makes reference to the Brewer suburb of Mount Judge, equivalent to Mount Penn east of Reading. Filmmakers Gary Adelstein, Costa Mantis, and Jerry Orr created Reading 1974: Portrait of a City; relying heavily on montage, the film is a cultural time capsule. David McMurtrie Gregg (1922) by Augustus Lukeman. ↑ "Population Estimates". United States Census Bureau. Retrieved June 11, 2014. ↑ "PHMC Historical Markers Search" (Searchable database). 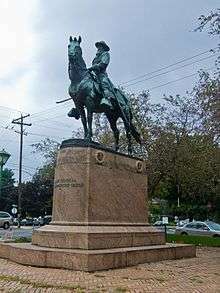 Pennsylvania Historical and Museum Commission. 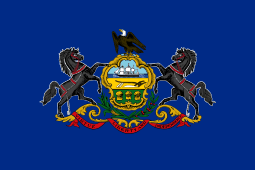 Commonwealth of Pennsylvania. Retrieved January 25, 2014. ↑ "Reading (city) QuickFacts from the US Census Bureau". census.gov. Retrieved October 17, 2016. 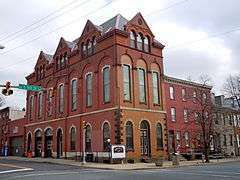 ↑ "Census Shows Reading, Berks growth spurt". Retrieved March 13, 2011. ↑ Tavernise, Sabrina (September 26, 2011). "Reading, Pa., Knew It Was Poor. Now It Knows Just How Poor.". The New York Times. ↑ "Reading (PA) Bronze-level | International Mountain Bicycling Association". www.imba.com. Retrieved 2016-10-14. ↑ "Reading 120 | September 10, 2016". www.reading120.com. Retrieved 2016-10-14. 1 2 "content.aspGreater Reading's destination hub : Greater Reading Convention and Visitors Bureau". Readingberkspa.com. Retrieved May 7, 2013. ↑ Washington, D.C. became the national capital in 1800. ↑ Zinn, Howard. A People's History of the United States 1492–present (New York: HarperPerennial, 1995), p. 243. ↑ Clymer, Floyd. Treasury of Early American Automobiles, 1877–1925 (New York: Bonanza Books, 1950), p.158. ↑ "City Crime Rankings by Population Group". morganquitno.com. ↑ Interview with Barbara Corcoran on NBC's Today show. Online. December 2007. Retrieved September 27, 2009. 1 2 "The Beleaguered Middle Class". The New York Times. June 13, 2012. ↑ "Major Employers". Greater Reading Economic Partnership. ↑ "New Director Will Lead Reading's Jump Start Incubator". bctv.org - Local news about Berks County and Reading, Pa. Retrieved 2016-10-14. ↑ United States Census Bureau. "Census of Population and Housing". Retrieved August 28, 2013. ↑ "Annual Estimates of the Resident Population: April 1, 2010 to July 1, 2013". Retrieved June 11, 2014. ↑ "Reading (city) Quick Facts from the US Census Bureau". United States Census Bureau. Retrieved May 27, 2015. ↑ "Berks County, Reading unemployment rates rise in May – bctv.org – Local news about Berks County and Reading, Pa.: Special Reports". bctv.org. June 29, 2010. Retrieved May 7, 2013. ↑ "PAGE NOT AVAILABLE". readingpafire.com. ↑ "ReadingPaFire.com - News". readingpafire.com. ↑ "Keith Haring's pop art celebrated in today's Google Doodle". National Post. May 4, 2012. Retrieved May 4, 2012. ↑ Charles Isherwood (August 16, 2015). "Review: Lynn Nottage's 'Sweat' Examines Lives Unraveling by Industry's Demise". New York Times. Retrieved February 2, 2016. ↑ Sadie Dingfelder (January 21, 2016). "'Sweat' by Lynn Nottage gives voice to the 'new poor'". Washington Post. Retrieved February 2, 2016. 1 2 3 Reichler, Joseph L., ed. (1979) . The Baseball Encyclopedia (4th ed.). New York: Macmillan Publishing. ISBN 0-02-578970-8. ↑ "BARRASSO, John A., (1952– )". Biographical Directory of the United States Congress. Retrieved November 18, 2012. ↑ "David Robidoux". APM Music. Retrieved January 18, 2013.